The Hairy Bikers’ take on sausage casserole makes a wonderfully warming and filling dish, and it freezes brilliantly. Each serving provides 423 kcal, 23.5g protein, 16g carbohydrates (of which 9.5g sugars), 28.5g fat (of which 10g saturates), 4.5g fibre and 2g salt. Heat a tablespoon of the oil in a large non-stick frying pan and fry the sausages gently for 10 minutes, turning every now and then until nicely browned all over. Transfer to a large saucepan or a flameproof casserole dish and set aside. Place the onions in the frying pan and fry over a medium heat for five minutes until they start to soften, stirring often. You should have enough fat in the pan, but if not, add a little more oil. Add the garlic and cook for 2â3 minutes more until the onions turn pale golden-brown, stirring frequently. Stir in the tomatoes, chicken stock, tomato purÃ©e, Worcestershire sauce, brown sugar and herbs. Pour over the wine, or some water if youâre not using wine, and bring to a simmer. 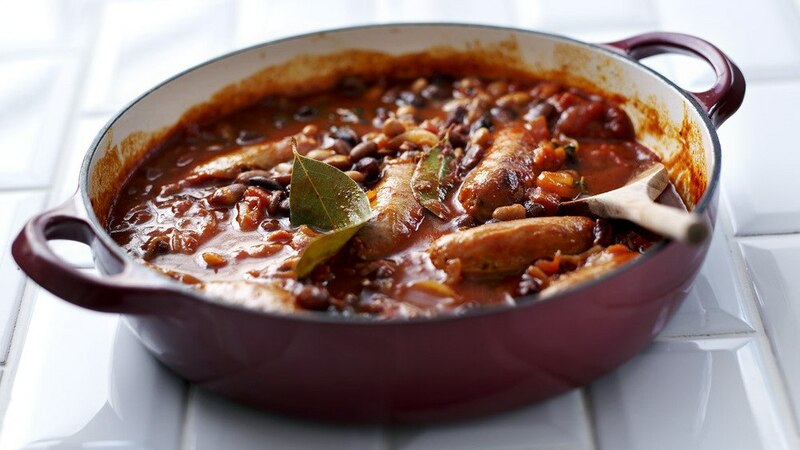 Tip carefully into the pan with the sausages and bacon and return to a simmer, then reduce the heat, cover the pan loosely with a lid and leave to simmer very gently for 20 minutes, stirring from time to time. Drain the beans and rinse them in a sieve under cold running water. Stir the beans into the casserole, and continue to cook for 10 minutes, stirring occasionally, until the sauce is thick. Season to taste with salt and freshly ground black pepper and serve with rice or slices of rustic bread.